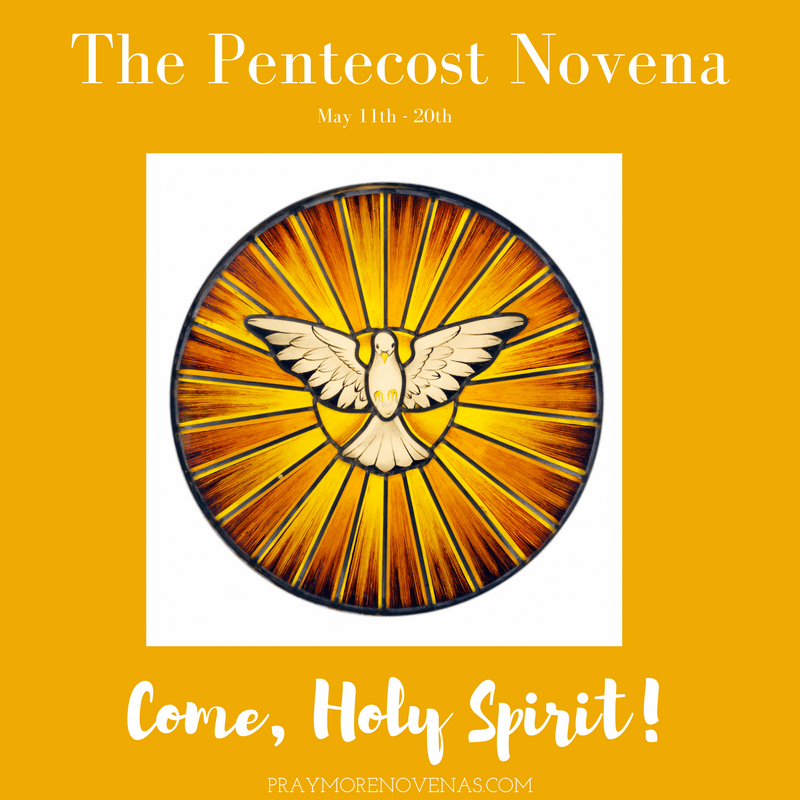 Here’s Final Prayer of The Pentecost Novena! My intention is for my nephew, Fr. John Dowling for his upcoming 35th anniversary as a priest on June 13th. I would also like to pray for my continued conversion and perserverance. Sacred Heart of Jesus please provide my son with a job. Provide peace in the family. Grant healing to all in the family. Bless all my family. Please help me get my confidence back and go to Halifax and relax and have a good day. In the name of the father. Amen. Dear Holy Spirit, please intercede for me that I will be the right candidate for one of the jobs I applied for. Let it be a good fit for me, with good compensation and benefits. Holy Spirit, intercede in my finances and deliver me from financial stress, help me find a home soon where I can be at peace for a while. Holy Spirit, protect my daughter and help her find a good summer job. Holy Spirit, please protect my family abroad. Please relieve us all from the stress and burdens we are currently carrying. Deliver us ! Intercede for us! Please deliver us Holy Spirit! Have mercy on us. Hear my cry, Holy Spirit! . I pray through Jesus Christ Our lord and Savior. Lord please watch over my son. Help him to be motivated to take the steps needed to get a job and please bless him with a job that will help him draw closer to you. Surround him with people that will be good spiritual influences for him to return to the church. I ask this in the name of your son Jesus. Thank you Holy Spirit! I pray for my sister Julie who passed Thursday into Heaven, that the Lord allow her a very High place in Paradise. Thank you St. JUDE for always being near me in difficult times, my prayers have been answered. I promise to always make your name known!! Still keep praying for me, always keep by my side for l still have challenges over my job forwhich your immense prayers are required. Always pray for my sickly mother Catherine to reduce pain in her stomach, chest and her respiratory system pain following her goiter operation 16 years ago which did not go well and ended up with a tracheotomy tube to assist her in breathing. St. JUDE keep praying for us and we shall keep exhaulting you name for all to know you. Thank you Holy Spirit for enlightening me this week. Thank you for allowing me to approach my staff member about her ways. Only you would make that possible. Thank you in Jesus’s name I pray Amen. Please hear my prayer request oh Lord and St. Jude. I thank you everyday for the abundance of love and gifts you have given me. I pray now that you will intercede in helping the Father of my 3 children and I to reunite. We love each other dearly but can’t find common ground. Please shine down upon us your miraculous works so that we may all be under one roof as a family again. In Jesus name, Amen. Dear Lord and God our Father fill me with your spirit . Give me the courage , strength and the wisdom to hear you and listen to your voice. Thank you Lord for all my blessings. I ask that you keep my grandson safe. I pray for L that w she will turn her life around . I pray for T that he will take the right path. I pray for my husband that he will be free from his band pain. I pray for all my children and grand children that they will follow you. I pray for health, happiness and peace for all my friends and family. I pray for our country, for our leaders and for the world to live in peace. I ask all this through Christ our Lord Amen ? Please continue to pray with me for ME and JM to continue their relationship. Please help me to accept the things I cannot change and to have a closer relationship with ME. I promise to continue to encourage devotion to you and my beloved saints, St. Jude, St. Anthony, Blessed Mother and our Lord Jesus Christ. Thank you for hearing my prayers and bringing ME and JM closer. Holy Spirit, Thank you for hearing our concerns. Please to continue to Watch over our living children and please, help those whom are suffering from depression. God bless our troops. GOD BLESS those whom died recently in Santa fe Tx. Strength the heart of the family’s whom lost a love one. What a tragedy for a mother whom just went through celebrating mother’s day whom now has to bury a child. Please pray for my son, a college student, to again see the value of going to church. I believe he still has the love of God in his heart, may he act upon that love and come back to the church. Dear Holy Spirit I still continue praying for my incoming nursing board examination on June 3and 4..Help me guide me give me retentive memory and more knowledge especially just 14days lift ..Give me focused concentration and strength to finish all my reviewer on time..Heel me especially today I’m suffering my severe dysmenorrhea so that I can study well…send me your angel to guide me to be the topnochers of nurse licensure examination on June with the average of 88percent ..I trust in you Amen..
Holy spirit I place my financial needs into your hands. I pray for financial deliverance. I pray for no ry to meet the financial needs of my son. Holy spirit please cover my son and my family with the precious blood of Jesus Christ. Lord please protect my husband and children.I pray that my children be successful with their studies. Annie! Thank Ye so much for reminding me 2 join with the Novena every day… A great job!! “We are all God’s Perfect Work of Art”… maybe today… I will believe those words? ?